It’s the time of the season when the best on the court take the court in the annual WNBA All-Star game which this year is held for the first time at KeyArena in Seattle. Ten WNBA players were voted to start the game, five from the East Conference and five from the West. 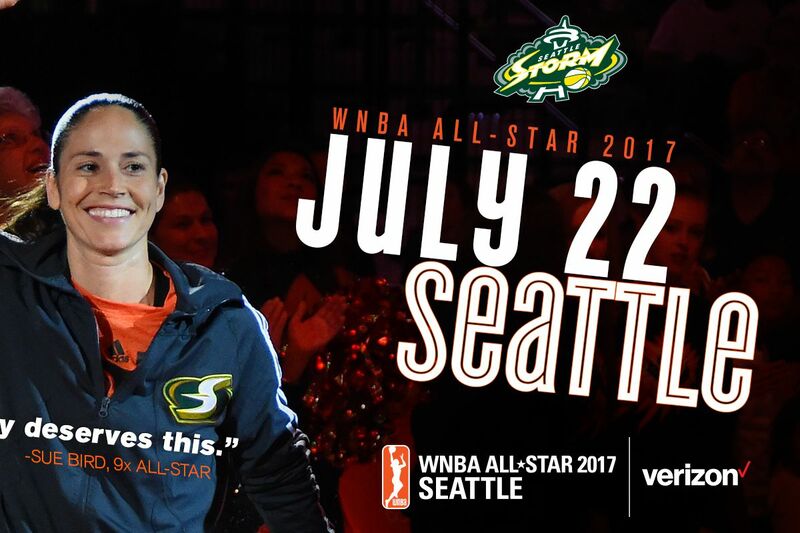 With the game being held in Seattle many fans are excited to see Seattle Storm guard Sue Bird in her 10th All-Star contest. She ties the record for most All-Star appearances along with Indiana Fever Tamika Catchings who retired this year. It’s her eighth time voted in as a starter. Bird is the three-time assist leader and currently averages a career-best 6.7 assists in her 16th WNBA season. She needs 69 assists to surpass Ticha Penicheiro (2599) as the WNBA’s all-time assist leader and holds the record for assists in a single game with 10 in the 2009 game in Connecticut. Joining Bird in the backcourt is Phoenix Mercury guard Diana Taurasi who makes her eighth All-Star game all as a starter. She became the WNBA’s all-time leading scorer (7582) and all-time leading three-point shooter (952) this season. The West frontcourt adds Minnesota Lynx center Sylvia Fowles who is in her fourth All-Star game, third as a starter. She leads all players in true shooting percentage with 70.1 and is one of two players to average a double-double for the season and the only player to average at least 20 points and 10 rebounds. Fowles teammate on the Lynx, Maya Moore, makes her fifth All-Star selection, all as a starter and was the 2015 ASG MVP. During her MVP performance in 2015 Moore set the WNBA All-Star record for points in a game with 30 including six three-pointers are second most ever and most in regulation. Rounding out the West team is Los Angeles Sparks center Candace Parker. Parker is in her fourth All-Star game, all as a starter but did not play in 2011 when first selected. She was the 2013 ASG MVP where she set, at the time, the ASG-record of 23 points as the West won. Parker ranks third overall and first among All-Star starters in block percentage (5.3). Parker and Moore are the only two players in the WNBA to rank in the top 22 of all five major statistical categories. For the Eastern Conference, the backcourt adds the Atlanta Dream’s guard Tiffany Hayes who makes her first All-Star game and is one of three first-time All-Stars, all from the Eastern Conference. She ranks 10th in the WNBA in both scoring (16.6 ppg) and three-point percentage (40.7) with career-best numbers in both categories. She ranks fourth in steals with another career best 1.69 per game and her career-best 4.5 rebounds per game is fifth among guards. Connecticut Sun guard Jasmine Thomas joins Hayes in the backcourt with her first All-Star selection and is one of two players (Skylar Diggins-Smith the other) to average at least 15.0 points and 5.0 assists on the season. She ranks third in the WNBA in three-point percentage (47.9). Washington Mystics forward Elena Delle Donne is part of the Eastern Conference frontcourt starters making her fourth selection all as a starter though Delle Donne will not participate this year due to injury. She ranks fifth in scoring (19.8 ppg) and seventh in blocks (1.53) this season. She’s the WNBA’s all-time leader in career free-throw percentage (94.3) missing only three of her 105 free throw attempts. Heading to her fifth All-Star game is New York Liberty center Tina Charles. It’s her third as a starter. Charles leads all players in usage rate (29.1) and minutes played (34.4). She currently ranks second in points (20.8) and third in rebounding (9.1). The final member of the East team is Connecticut Sun center Jonquel Jones. It’s her first All-Star selection and she leads all players in overall rebound percentage (24.0) as well as offensive (16.9) and defensive (31.3) rebound rate. She is the only other player (Fowles) to average a double-double this season. She is second among centers in three-point percentage (48.0). The All-Stars will be joined by reserves chosen by the coaches and will participate in a variety of events besides the All-Star game. 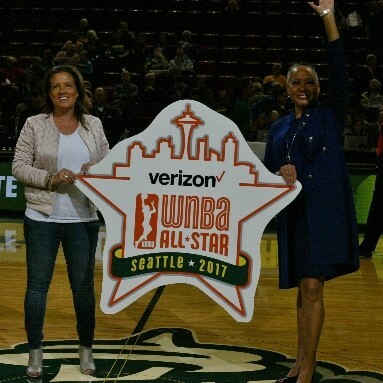 Photo: Seattle Storm President & GM Alisha Valavanis (left) joins WNBA President Lisa Borders as they share the WNBA All-Star logo with Storm fans. On Thursday, July 20th All-Stars will lead a basketball clinic on Mercer Island and that night they will toss out the first pitch at the Seattle Mariners game before the Mariner’s take on the New York Yankees. On Friday, July 21st it’s an early morning rise up for some of the All-Stars as they head to the top of the Space Needle to raise the WNBA flag which will fly throughout the weekend. The teams will hit the court for practice before walking the orange carpet back at the Space Needle for the All-Star gala. Saturday, July 22nd is the big day as the All-Stars face off on the court. If you plan to attend come early as the Bite of Seattle is going on as well the Capital Hill Block party. The game tip-offs at 12:30pm and will include a three-point contest at halftime. Each participant ranks in the league’s top eight in three-pointers made and three-pointers made per game this season through July 17. A new element is added this year to reflect the off-court contributions of the players and their roles as leaders on social issues and philanthropic efforts. The WNBA together with the WNBA Players Association will, for the first time, donate $10,000 to the winner’s charity. Bird will be representing and competing for The Moyer Foundation and Moore looks to win for Win With Justice, a program of the Social Impact Fund. Quigley will be hitting buckets for The Patrick Quigley memorial Scholarship, Rodgers for Hopey’s Heart Foundation and Thomas for St. Jude Children’s Research Hospital. 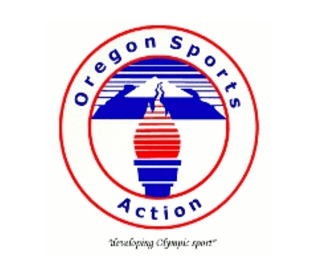 The contest will be aired nationally live along with the game on ABC.